Herbs and Spices are an essential part of Thai cooking. 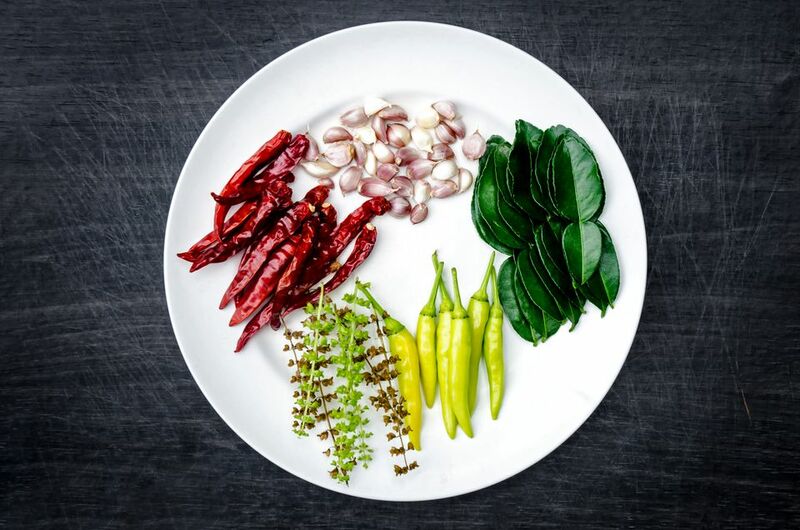 Used in combination, they help achieve a balance of the four essential Thai tastes: salty, sour, spicy, and sweet. Nearly every Thai recipe begins with a paste. While it is possible to buy ready-made Thai pastes (such as red, yellow, and green curry), these packaged spice mixes will not give you the same flavor and aroma—not to mention nutrients—as a paste made from scratch. Most Thai pastes start with shallots (or onions), garlic, and green or red chilies. Added to this may be a variety of other spices and herbs, including dried or fresh coriander, Thai chili powder, galangal, green peppercorns, lemongrass, and turmeric. Kaffir lime leaves are also a common ingredient, lending a uniquely Thai flavor to pastes or simmering dishes. Lemongrass is used in various ways in Thai cooking. For some dishes, it is chopped and pounded, other times it is simply cut into long pieces and “bruised” (bent and kneaded or even lightly cut in several places) to release the scent and flavor for soups and curries. Galangal is a relative of ginger, as is fresh turmeric. If you can't find galangal (it's usually purchased frozen at Asian food stores in North America), you can substitute ginger. These roots (actually rhizomes) add valuable nutrients and depth of flavor to many Thai dishes.